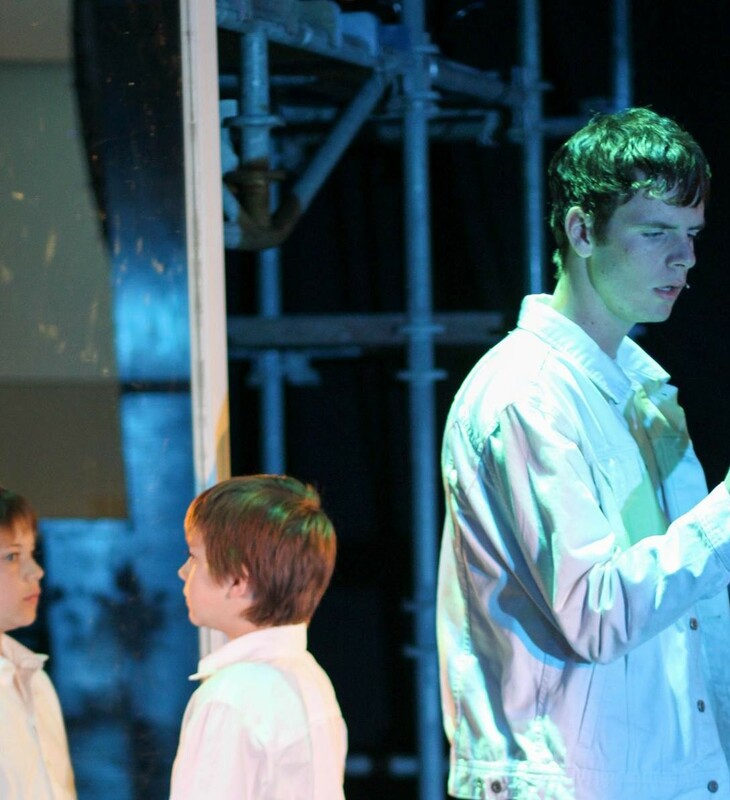 How can we create opportunities for students to immerse themselves in the production process? Especially when they’re not quite ready for participation in a mainstage production? It’s wonderful when students can come to mainstage productions with some understanding of what it’s like to be a part of a production team. It makes the process easier to assimilate to, and more fun. It’s even more wonderful when their minds have been opened to the myriad of other possibilities for people who like creating stories beyond acting. Most drama students love acting. Most won’t become actors. It’s very important to acknowledge that there is a place for everyone in theatre, and allow students opportunities to take on “roles” that are not only those in the spotlight. It’s equally important to introduce students to the work of hard collaboration, deadlines, and the pressures of production, preferably before they encounter a real audience. For a long time, my Beginning Drama students did a great project called Soap Operas, passed on to me by my master teacher John Ribovich. You can find that project here if you are interested. This was back in the day, when kids grew up with an awareness of soap operas, passed down to them by family members who loyally watched a particular show over time. Kids who didn’t watch often had relatives who did, so these products were fairly faithful to the genre. Then came reality TV and a lot more programming in the animated or scifi/fantasy genres, as well as increasing options for entertainment. Fewer students were having common viewing experiences. I tried for a couple of years to contextualize soap operas in the context of TV history, and tried again to link the project to its popularity in other markets that were relevant to my students- it is still, for instance, an important and popular genre in South America, India, and Korea. But the scripts were no longer really holding together, as the students had not internalized the model, so after a brief flirtation with the idea of doing “Adventure” stories, I decided that there must be an easier way to work on the concepts of stock characters and situations with my students, as well as forcibly immerse them in production in a low-stakes way. And so this year I experimented with a project called “The Five People You Meet in Cupertino.” And it worked. You can do this. But obviously change the name to the name of your school. It makes a great summative assessment. A nice final exam. Lunch-If you’ve already worked with your kids on archetypes via status work, this will be a natural shift. If not, print out a black and white map of your school, like the emergency preparedness one, and hand a copy to each kid. Ask them to create a visual map of “lunch” depending on where students hang out. You will gain a lot of insight, because you will clearly see the social network of your school, and the territory claimed by each tribe. Popular people hang out at this one table in the cafeteria. Kids who play “insert newest card game” hang out here. All the ELA kids tend to hang out near this bench. Skaters hang out behind the gym. Preps hang out in the library but don’t eat. So then divide your students into groups of 5 or 6 (I suggest choosing the groups to balance gender, ability, and background). I suggest doing this because they will be together for 2 or maybe 3 school weeks, and group dysfunction will throw off class climate. Then introduce the activity. What makes our school unique? Who are the 5 people you meet at our school? Ask for four, and then ask for a type of adult to make the project interesting. Aim for a broad enough category that gender is flexible, that ethnicity can be worked into it. Here are some of the five people(students), you meet in Cupertino, according to my kids. The Overachiever. Does everything, joins everything, has a 6.0 GPA unweighted. The Slacker. Does nothing, but has a lot of potential. The Poser. Appears to be or tries to be one way, is actually another. The Foreigner. New to the community. Trying to learn the rules. Or not. The Sidekick. Always hanging out with one of the other characters, mirroring their actions. The Gamer/Phone Freak, or Hacker. Obsessed with the virtual world. The Helicopter Parent- Constantly embarrassing their kid in front of others with their lack of boundaries and vast array of connections. The Superenthusiastic Teacher- Constantly in the face of the students. Their relentless positivity extends beyond the boundaries of failure. Including their own. The Adolescent- Adult. Wants to fit in with all the cool kids. Problem is, that ship sailed in 1989. The idea is, you want five people. They don’t have to be, and shouldn’t, be the five people above. All groups need to use the same five people. Then move onto five events. Someone breaks their phone or another significant piece of technology. There is an event of academic dishonesty. There is a bromance ( an intense friendship between two guys). There is an academic competition. Something goes wrong on clubs day. You can allow students to tailor make the situations to your school. The idea is, they should be general enough to be universally applicable. Stay away from things that are tied to race or gender, let the kids figure it out as it applies to your world. Day 1-2 Groups assign roles, name their characters, and write a summary of a proposed plot. Day 2-3 Two members of each group pitch the project to the class and to you. This is a tough exercise, and well worth it. You can figure out which groups are gelling, and clarify any issues with story construction before they get out of control. Day 3-4. Introduce standard professional playwriting format. One way to make this easier for students is to use a program like Celtx, which students can access through a free trial in order to help them format their script. It’s never too early to introduce this skill and it makes it easier for students who go on to really want to write to submit their work to professional contests and the like. Plus, because the groups are fairly large the students can teach each other. Day 4-5-6 Students create a draft of their script and conduct a readthrough of their first scene in front of the class. This allows you to quickly assess whether groups are on track. Day 6-7-8 Students work with the script they have created (check for multiple copies and support this as necessary) to block their play. Day 7-8 Students should have a production meeting where they cover where they are in the memorization process, who is bringing/making props and costumes and what furniture they will need to use from the class stock if you have that. and lights and sound if you want them to do that, as simple as flipping the lights on and off, or playing sound effects on the class sound system or speakers off their phones. If you want a form for this, I just made one. Email me and I’ll send it to you. Day 9-10. Final touchups on the projects, students rehearsing in their groups. Maybe an opportunity for two groups to watch each other and give feedback, something I call a watch it. Now you are ready for performances. If you have steered the boat correctly, there will be a great deal of excitement on performance day as students rush around. I assess these (and I’ll send you the rubric if you want it) on preparation, script quality, characterization, voice, blocking, and pace, which includes smoothness of set changes. I want a well-rehearsed, well-executed play which shows that actors worked together and understand basic principles of characterization, staging, and performance skills. Try this out and let me know how you like it the next time you find yourself with a vast expanse of untrammelled time between projects. I’d love to know how it works in other places. This entry was posted in Archetypes, Class Culture, Stage Picture, Status, The Production Process on December 7, 2014 by The Drama Teacher.